October 13, 2011 - Piper Aircraft has enhanced both pilot and passenger comfort for its signature series of 2012 model year M-Class single engine business aircraft the turboprop Meridian, pressurized piston Mirage and unpressurized piston Matrix. 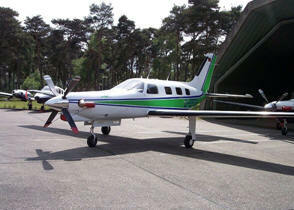 2012 Piper M-Class aircraft are available today. The biggest design changes have enhanced pilot comfort and cockpit access through incorporation of newly designed seating. Getting into a new Piper M-Class cockpit has never been easier, with flat fold-down aft-facing seats, a fold-down co-pilot seat and a cockpit assist handle to aid access. The cockpit has been sculpted to provide more elbow and hip room and additional seating comfort. The newly designed side panels have larger map pockets capable of handling pilot iPads, which are quickly becoming essential flight tools. When folded flat, the co-pilot seat offers a work surface and cup holders. The cockpit seat backs also are restyled for a modern appearance. The aft-facing seats have been redesigned with larger and reshaped bottom cushions, and the back cushions have been enhanced for firmer lumbar support, all for added long-range comfort. "All three of Piper's M-Class airplanes are eligible for bonus depreciation when firm orders and deposits are placed before Dec. 31, 2011," said Piper Executive Vice President Randy Groom. "Cockpits and cabins have been improved through incorporation of new technology and adoption of enhancements suggested by Piper's customers and our worldwide dealer network. Some customers have already purchased airplanes with these new features, and we are getting very positive feedback from the field." New 2012 top-of-the-line Piper M-Class airplanes fly with brighter external LED lighting, including taxi and landing lights and navigation illumination. Cabin reading lights and threshold lights have also been replaced with LEDs. These modern lighting systems are more efficient, more durable, and use less power. In the cockpit and cabin, sophisticated Bose A20 headsets are now standard equipment and the receptacles are hardwired for more power and better noise-cancelling capability while eliminating the need for batteries. The A20 is Bose's most advanced pilot headset and includes an auxiliary audio input and Bluetooth phone connectivity for pilots and passengers. The turboprop Meridian now has two 110-volt outlets for onboard recharging and for mobile devices, while the Mirage and Matrix have one additional outlet. All are configured to support numerous international plug configurations. Utilizing the EmPower? System by Astronics Corp., Piper has added cabin power to support passenger electronic devices for additional productivity and entertainment value. Making the cabin environments even more appealing, Piper has revamped internal air distribution. The Matrix and Mirage cockpits have newly engineered ducting and adjustable directional air flow vents for improved heated air volume distribution. In the unpressurized Matrix, a shutoff has been added to the modulation valve for cockpit control of ambient external air. The piston Matrix and Mirage aircraft also have beefed up cabin vents for more durability. All three M-Class Pilot Operating Handbooks show aircraft performance in 1,000-foot increments. M-Class aircraft offer Piper performance and safety built upon a proven airframe that has been an industry standard for years. Three refined derivatives comprise the full line: the Meridian, the Mirage and the Matrix. Each product fits it own niche and price point, and each aircraft provides a seamless step-up to the next level. Created to maximize the private travel experience, the M-Class line balances performance, efficiency and simplicity. The Piper Meridian is a single engine turboprop that seats six with club-seating. It is powered by the P&WC PT6A-42A 500 shp engine and has a 260 KTAS / 482 km/h max cruise speed and a range of 1,000 nm / 1,885 km. The standard equipped list price is $2,071,500, equipped with the Garmin G1000 avionics suite. The Piper Mirage is a single engine pressurized piston that seats six with club seating. It is powered by the Lycoming TIO-540-AE2A 350hp engine and has a 213 KTAS / 394 km/h max cruise speed and a range of 1,343 nm / 2,491 km. The standard equipped list price is $997,500, equipped with the Garmin 1000 avionics suite. The Piper Matrix is a single engine unpressurized piston that seats six with club seating. It is powered by the Lycoming TIO-540-AE2A 350hp engine and has a 213 KTAS / 395 km/h max cruise speed and a range of 1,343 nm / 2,491 km. The standard equipped list price is $869,000, equipped with the Garmin 1000 avionics suite. Piper Aircraft Inc. is headquartered in Vero Beach, Fla. A global force in aviation, Piper offers efficient single-engine and twin-engine trainer, personal and business aircraft. Piper Aircraft designs, manufactures, sells and supports the strongest and broadest single-engine product line in the industry, from high-performance pistons to turboprops to the world's most fuel-efficient seven-person business jet, the PiperJet Altaire.